We went for a walk in Folkestone, Kent last weekend. 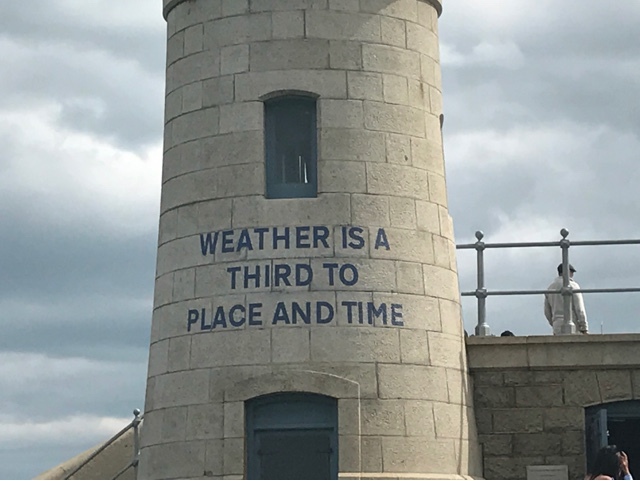 It was a tad windy and not as warm as we'd like but walking down the pier, that we'd only just discovered was open, I noticed this saying printed on the lighthouse and I just felt the need to photograph it. I googled it when I got home as it was a saying I'd not heard before and it comes up as reminder to how important the weather is to all that work at sea, a third coordinate if you like. What a great photo and obviously very relevant to you when it was colder than you were expecting while you were out!